Every spring, Pratt hosts a Green Week, with lectures, activities, discussions, and events about environmental themes in teaching, activism, design, art, and pretty much everything we study at this school. Green Week 2015 has commenced under the theme “Mitigation, Adaptation, Resiliency,” and you can open a schedule of activities here. 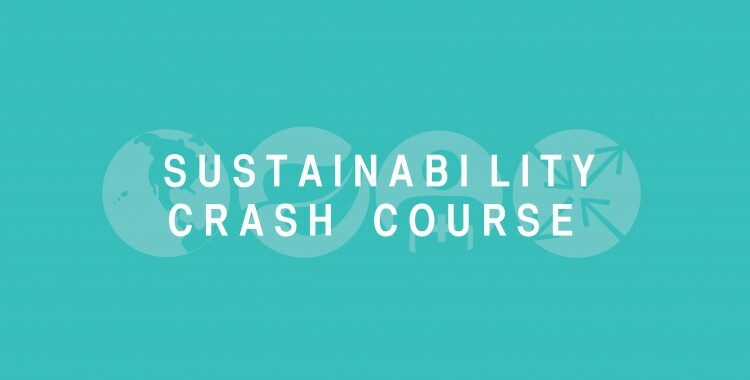 Three events of particular relevance to the Sustainability Studies program include Saturday’s Sustainability Crash Course, the Sustainability Minor display at Pratt Library all week, and an information session about the minor I’ll lead in North Hall 307 Wednesday afternoon from 2-4pm. If you have questions about the minor, the video display on the library’s first floor has basic information about courses, registration, contact information of the coordinator (me) and a few photographs of student work and activities in our classes. If you would like to learn more, or simply have a conversation about the minor, drop by North Hall 307 Wednesday afternoon and speak with me. This entry was posted in events, sustainability on March 27, 2015 by Carl Zimring. Whether actual experience or perception, the 2015 meeting of the American Society of Environmental History seemed as large and busy as it has ever been. In addition to catching up with colleagues, meeting new ones, and seeing the new books on display, I came away from the conference with a pair of impressions. The first involves format. This year’s schedule emphasized roundtable discussion, and in my experience (as both panelist and audience member), every roundtable successfully generated candid and creative discussions about where environmental history may go. I hope the society will continue to emphasize this format in the future. The second involves approach. One theme of many sessions was the centrality of work to the ways humans, other organisms, and the environment have interacted throughout time. Ed Russell continued his fascinating approach to evolutionary history with a preview of his book on greyhounds. Building on the work he’s done since the Envirotech e-mail discussion “are organisms technology?” almost fifteen years ago, Ed argued the preindustrial notion of dog breeds had more to do with behavioral traits than physical appearance, and breed became define by the specific jobs the dogs were expected to perform. I look forward to reading Fast Dogs and Englishmen when it is published, and not simply because I’ve lived with retired racing greyhounds for the past decade or so. Speaking of Envirotech, the group’s Saturday-morning breakfast was larger than I’ve ever seen, with about fifty attendees. Though I was able to talk to a small fraction of the attendees, the research questions and approaches from members continue to be among the most interesting work around. As for my work, Connie Chiang, Rob Gioielli, Agnes Kneitz, Chris Wells, and I participated in a roundtable on the Future History of Environmental Justice Thursday with a splendid conversation involving temporal scopes, analytical frameworks, identity issues, and politics. Thanks to them and the audience, we had an engaging discussion for the entire ninety minutes. In keeping with my upcoming book Clean and White (and a theme I’ve focused on since 2004’s “Dirty Work” article), my contribution involved arguing that looking at the relationship between work, human health, and the environment was a particularly fertile way to forge new scholarship on the histories of environmental inequalities. A later panel on social history and environmental history featured a similar argument, and Chad Montrie’s admonishment that environmental historians need to look at labor and labor’s experiences as we craft narratives of the history of environmental movements is especially relevant. Attention not only to work in this vein already being presented at the conference, but also reaching out to listen to historians and historical organizations such as LAWCHA whose concerns may relate (even while not defining them as environmental history) would be potential areas where ASEH can learn, engage with new voices, and collaborate in the future. 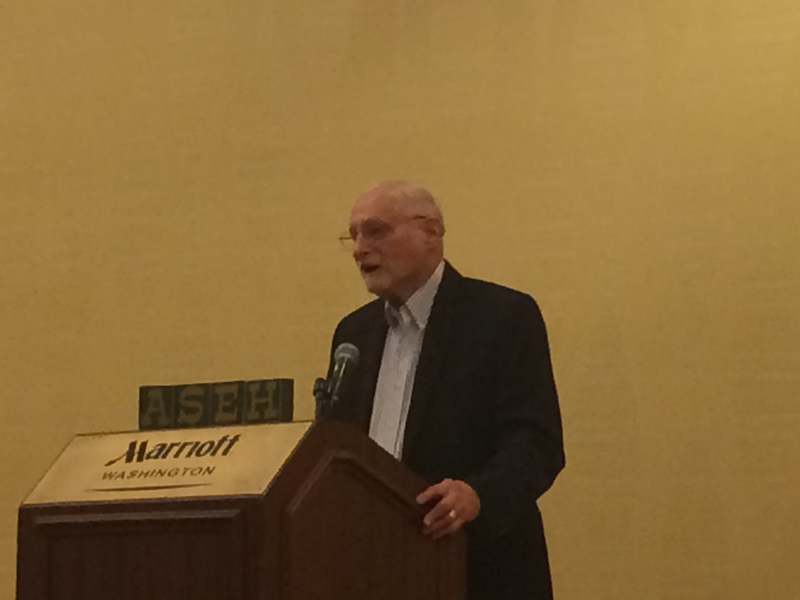 Joel Tarr receives ASEH’s Distinguished Service Award, March 2015, Washington, DC. Most of the work discussing work completed, the conference concluded with an awards ceremony capped by my dissertation advisor Joel Tarr receiving the organization’s distinguished service award to a standing ovation. I cannot comprehend how my thinking, career, and life would have turned out if not for Joel, and the room was full of people who could say the same. Having the society acknowledge his influence so enthusiastically was a fitting end to the weekend. ASEH meets in Seattle next spring under the leadership of new president Kathy Brosnan and president-elect Graeme Wynn. The call for proposals is here. This entry was posted in Clean and White, events, history on March 23, 2015 by Carl Zimring. The American Society for Environmental History holds its annual meeting in Washington DC this week. See the program (link opens PDF) for specifics; I’ll note here that a few activities involve questions of environmental justice, environmental racism, and environmental inequalities. These include a Thursday morning panel of papers, a field trip, and a roundtable discussion. I’m part of that last one. Thursday morning at 10:30, Connie Chiang, Rob Gioielli, Agnes Kneitz, Chris Wells, and I will participate in the roundtable discussion “The Future History of Environmental Justice.” Some of my comments will involve my forthcoming book Clean and White: A History of Environmental Racism in the United States, and the discussion promises to be a lively one. I should mention that this conference will also serve to unveil my colleague Jim Longhurst’s brand new book Bike Battles: A History of Sharing the American Road, recommended reading for cyclists and infrastructure enthusiasts. This entry was posted in events, history on March 16, 2015 by Carl Zimring. I’ll talk trash (and decay) with a few of my Pratt colleagues on Saturday. Details below. 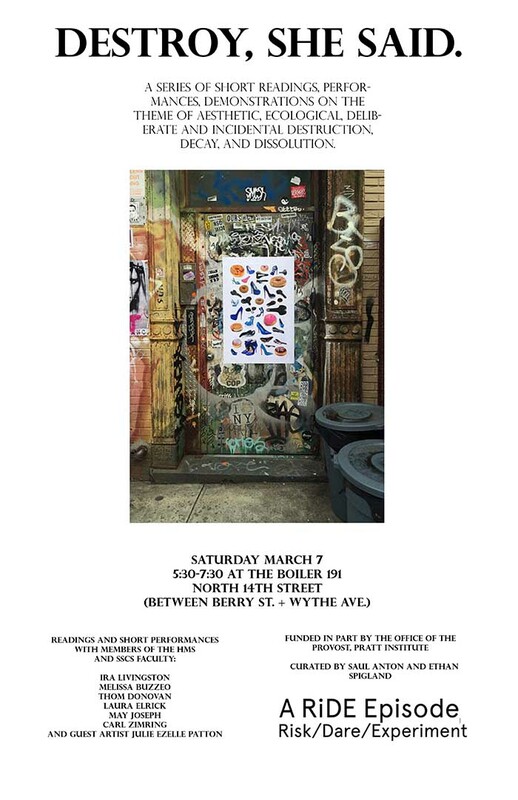 An exhibition, along with an evening of short readings, performances, demonstrations on the theme of aesthetic, ecological, deliberate, and incidental destruction, decay, and dissolution. Open to the public. Saturday’s program follows Friday’s opening reception. This entry was posted in events, exhibits, waste on March 2, 2015 by Carl Zimring.